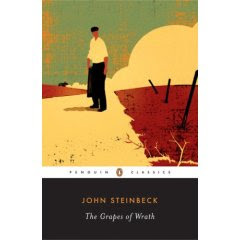 The Grapes of Wrath is the story of the Joads—a sharecropping family from Oklahoma which is driven from its land during the Dust Bowl era. The Joads proceed to travel west to California in hopes of finding work. This road trip in search of the American Dream is fraught with disappointment and defeat at every turn. The family starts out optimistically with all of them—Granma and Granpa, Uncle John, Ma and Pa Joad, slightly odd oldest son Noah, recently paroled Tom, tomcatting Al, pregnant daughter Rose of Sharon and her husband Connie, young children Winfield and Ruthie, and ex-preacher Casy—hoping for a land where they can pick and eat fruit straight from the tree and make enough money to afford a house with a white picket fence. They procure a used vehicle and convert the bed to hold the entire family and all of its worldly possessions, including the family dog. From the moment shortly into the journey that the dog is run over on the highway (to be honest, the foreshadowing begins even earlier than that), the reader knows that this family’s journey is not going to end well. I found The Grapes of Wrath to be one of the most well-written books I have ever read. It is the sort of book that stays with you, provoking thought long after you are through with it. Steinbeck’s characterization of each member of the family is so vivid and thorough that it felt like they could be my own relatives. Each of them has a strong sense of family and humanity and the reader is left pulling for them as the last of their resources dwindle away and they reach their destination only to be faced with persecution and impending starvation. Steinbeck interchanges his chapters between telling the family’s story and providing a broader social commentary—showing that this family’s journey is only a microcosm of the journey of hundreds of thousands of Americans at the time. If you have not read The Grapes of Wrath, I would definitely recommend it. Not only does it provide a fascinating look into a dark period of American history, but its relevance continues as it mirrors many of the challenges faced by immigrants today. Jen, I'm sure you know, but I'm in absolute full agreement. I think this is one of the best books I've ever read and I find it amusing that two months ago I dreaded embarking on it. I wish this had been required reading in high school. I got a lot more out of it than The Pearl, which I guess filled our high school English Steinbeck quota. I'll have to check out The Good Earth.